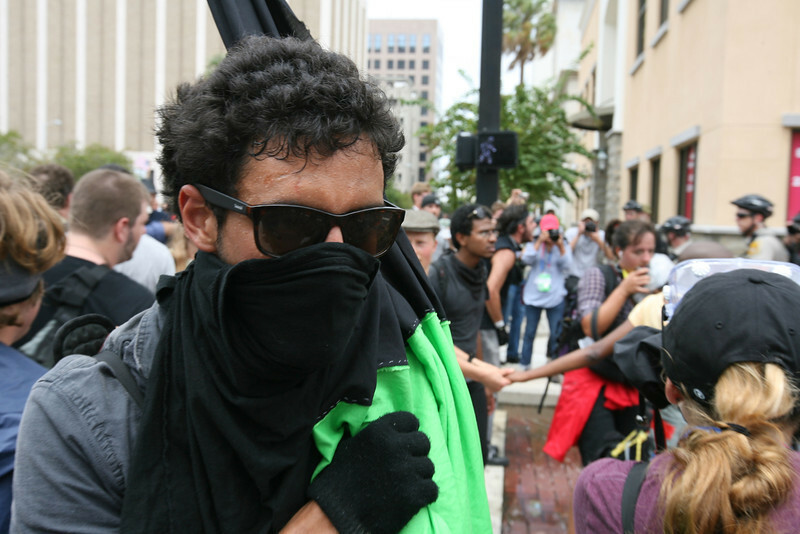 A member of the black bloc covers his face in front of cameras as protesters prepare for the Coalition March on the RNC, August 27th, 2012 in Tampa, Florida. 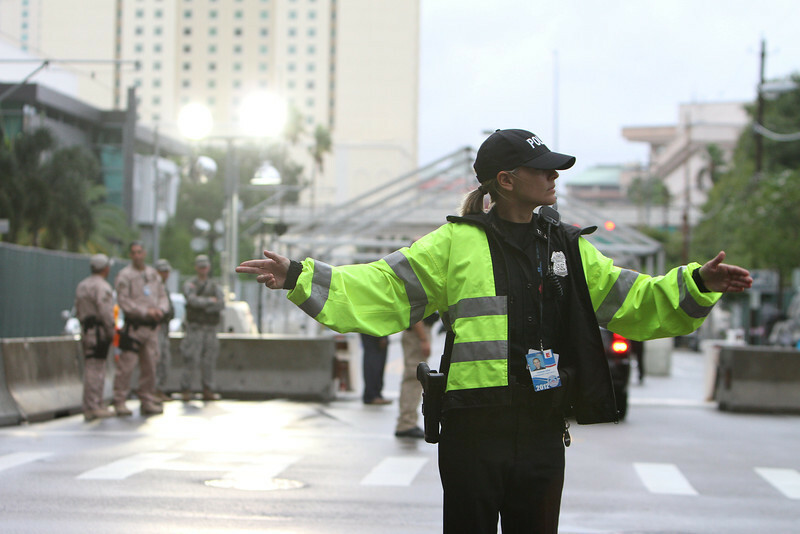 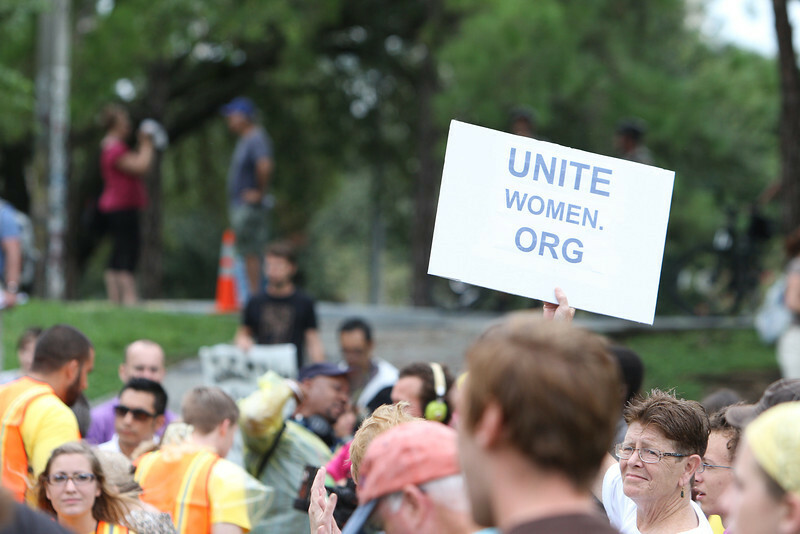 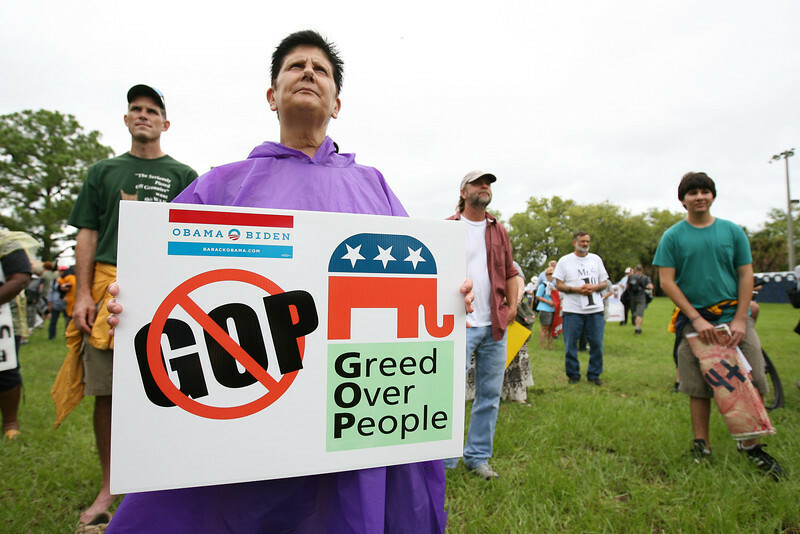 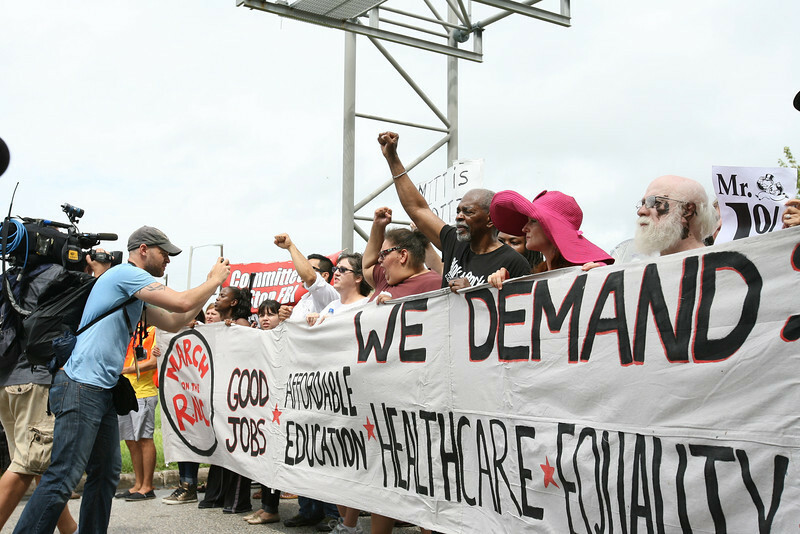 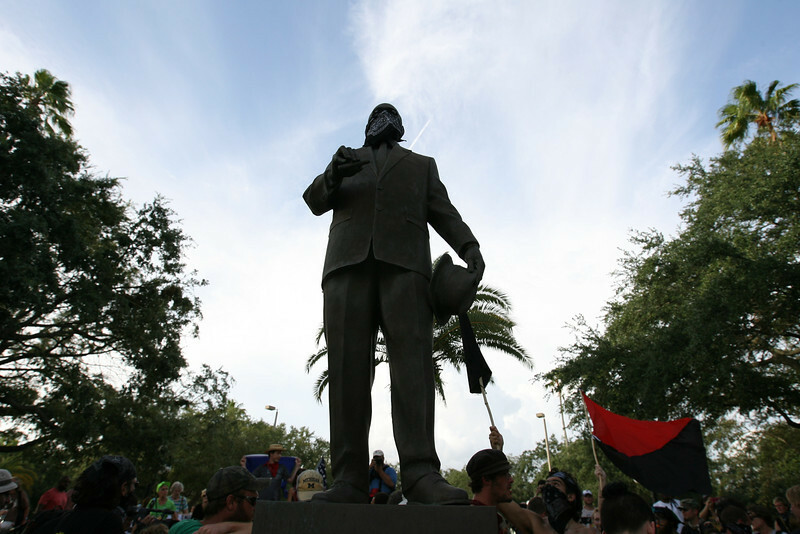 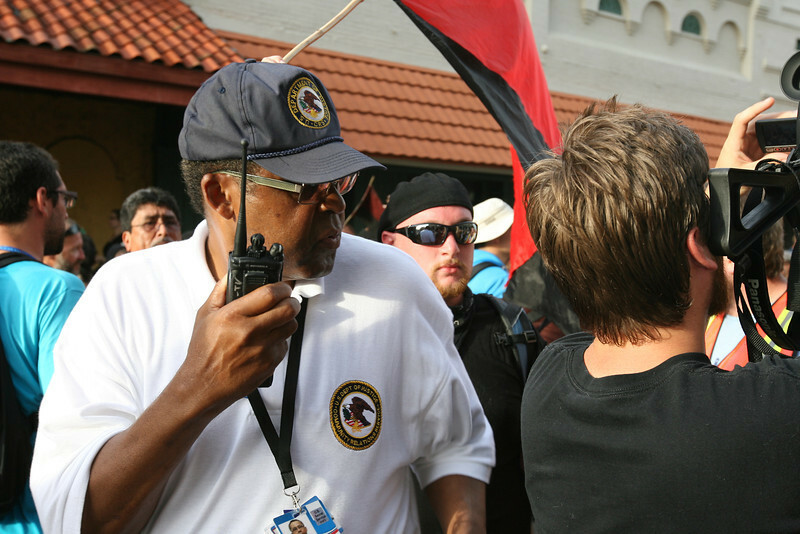 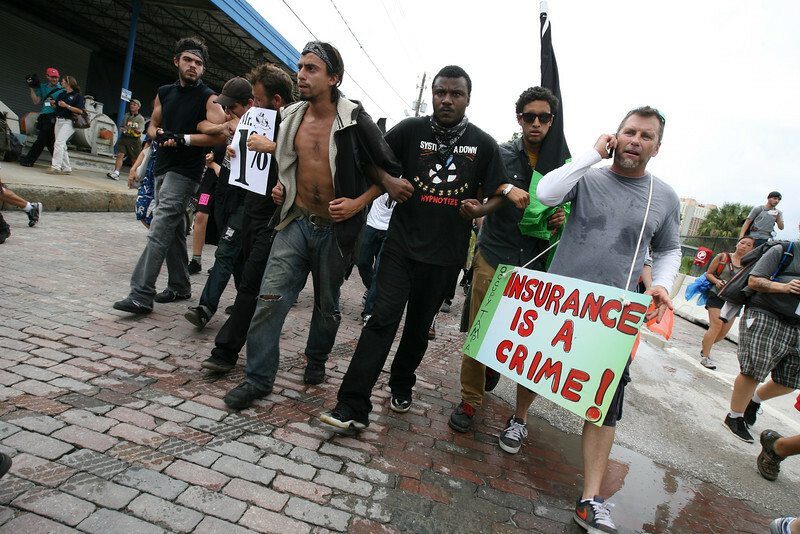 Activists gathered from around the country to attend the protests, but many were absent due to the approach of Hurricane Isaac. 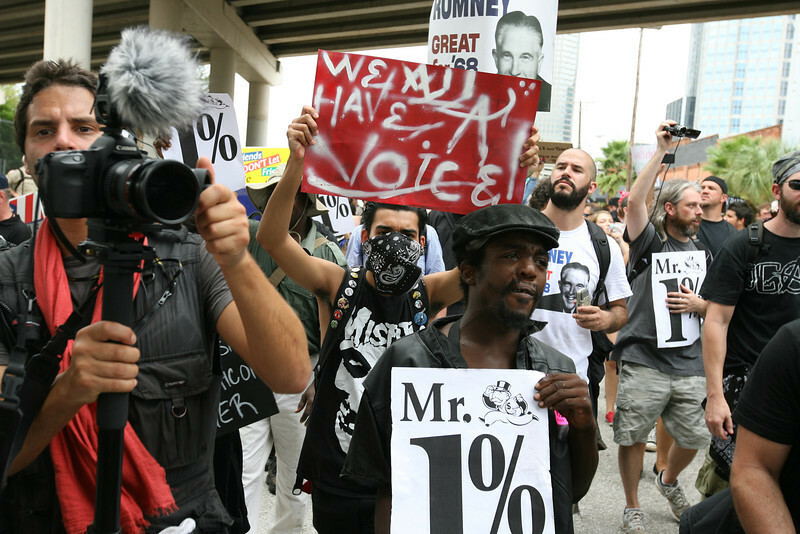 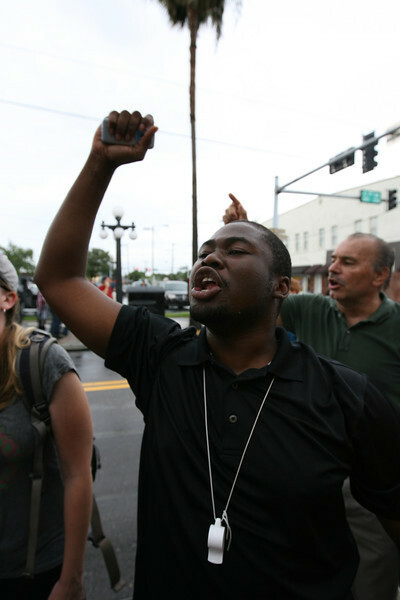 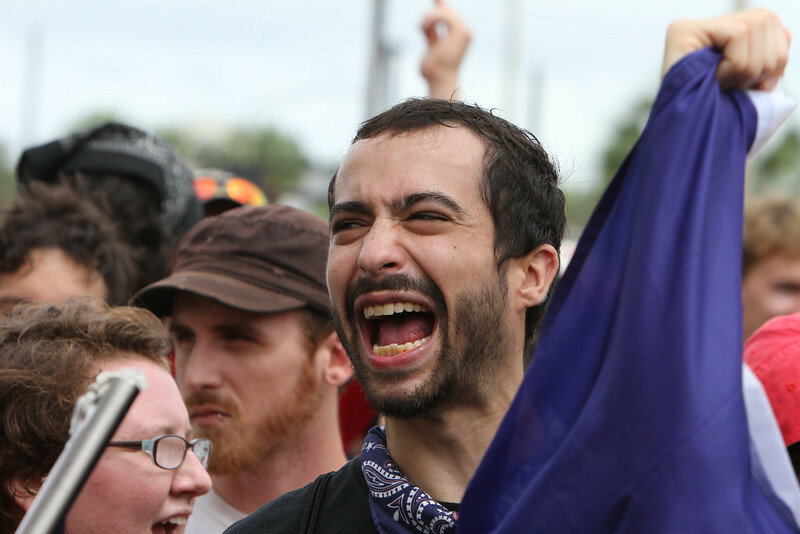 A protester shouts a chant as the Coalition March on the RNC makes its way through the streets of downtown Tampa, Florida on August 27th, 2012. 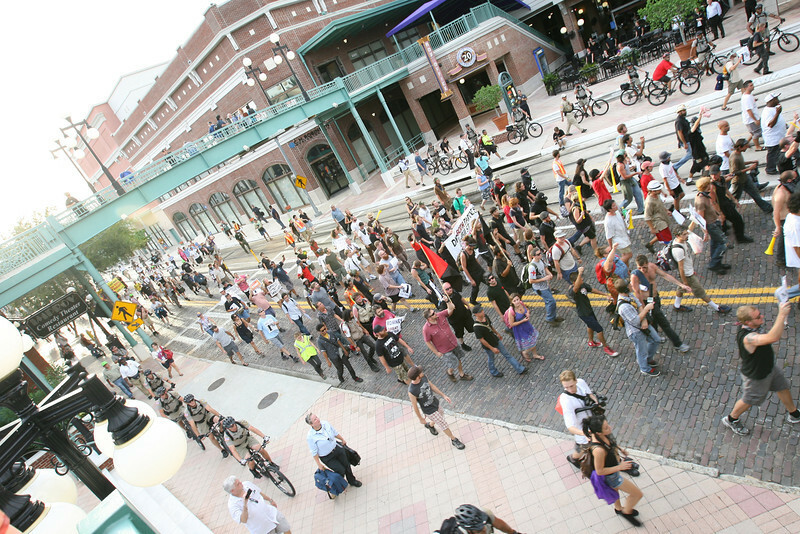 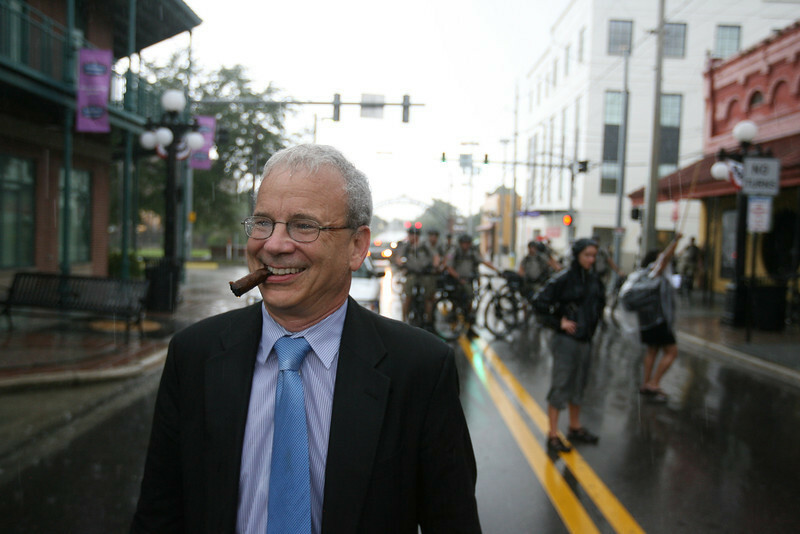 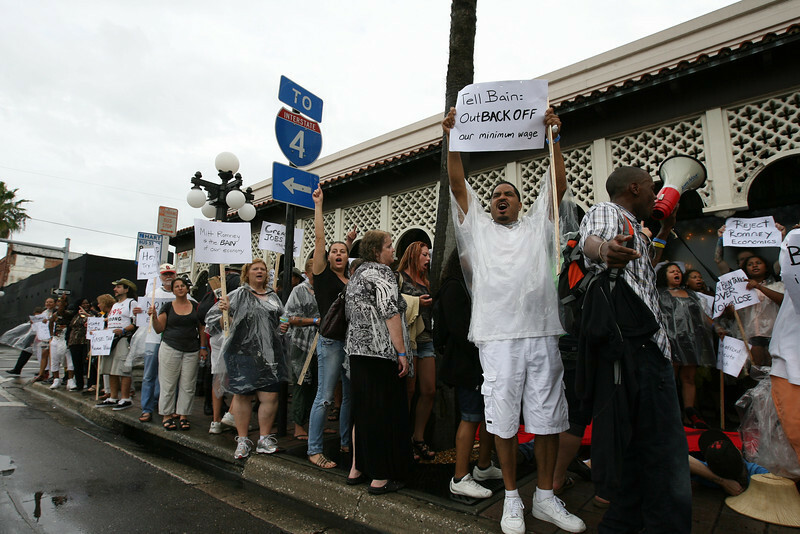 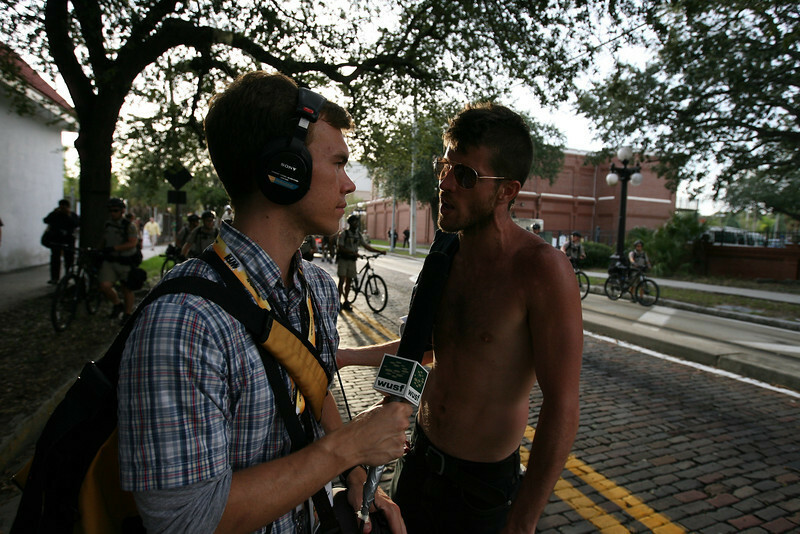 Protesters march down the streets of the Ybor City district of Tampa, Florida on August 28th, 2012. 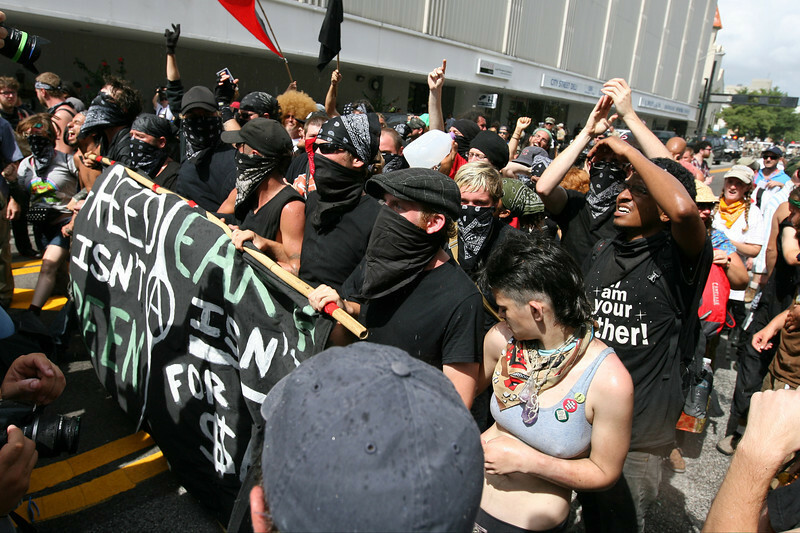 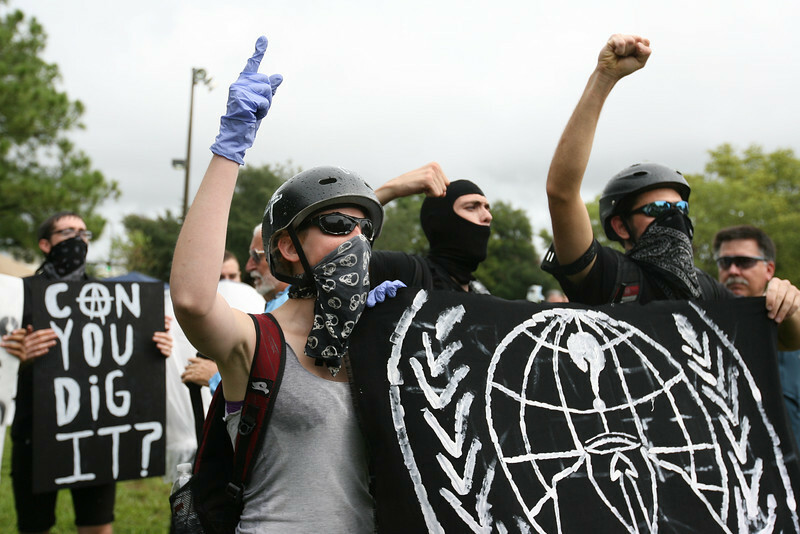 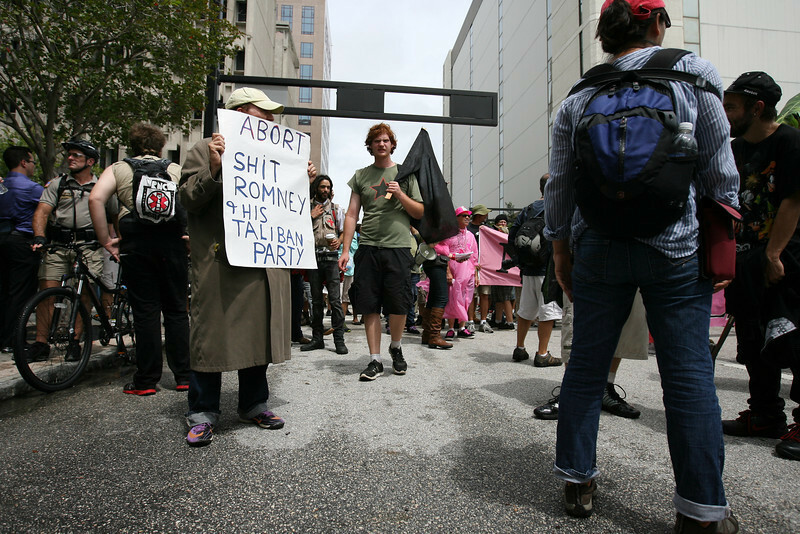 Members of the black bloc prepare a banner for the Coalition March on the RNC on August 27th, 2012. 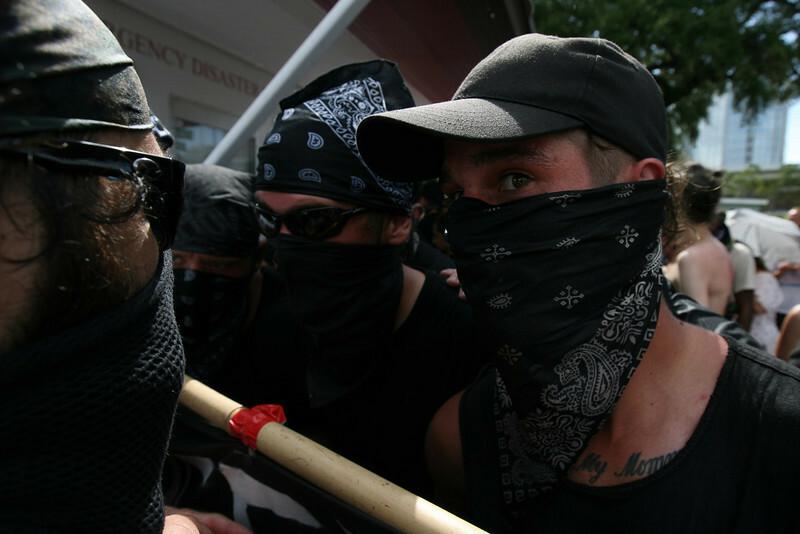 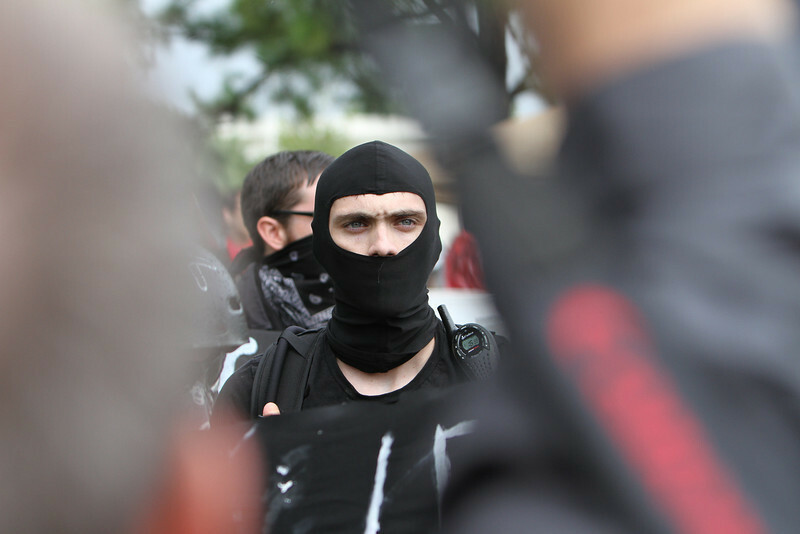 The black bloc is a group of activists promoting anarchy, and traditionally cover their faces to avoid identification. 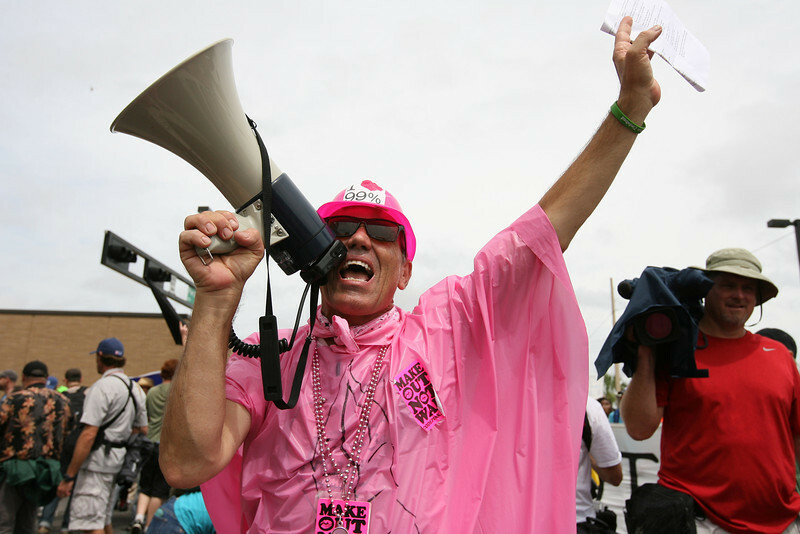 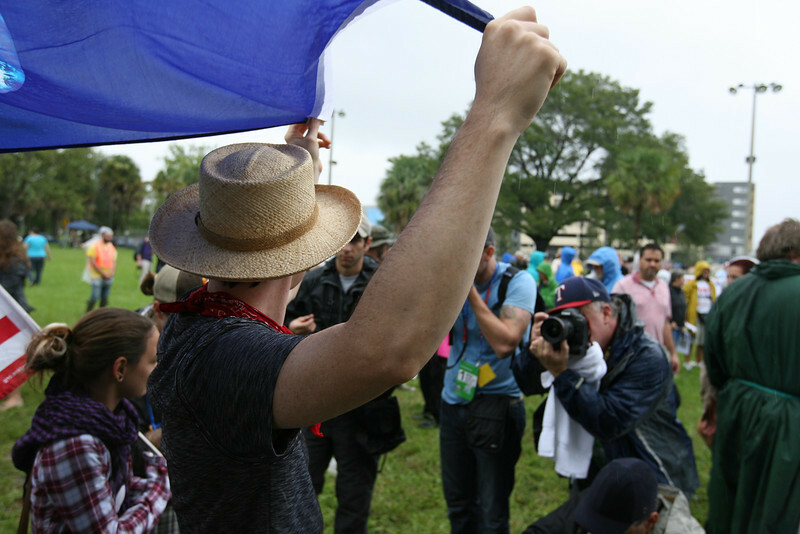 A member of the Code Pink activist group shouts into a megaphone as the Coalition March on the RNC marches its way to the Republican National Convention "public viewing area" in downtown Tampa, Florida. 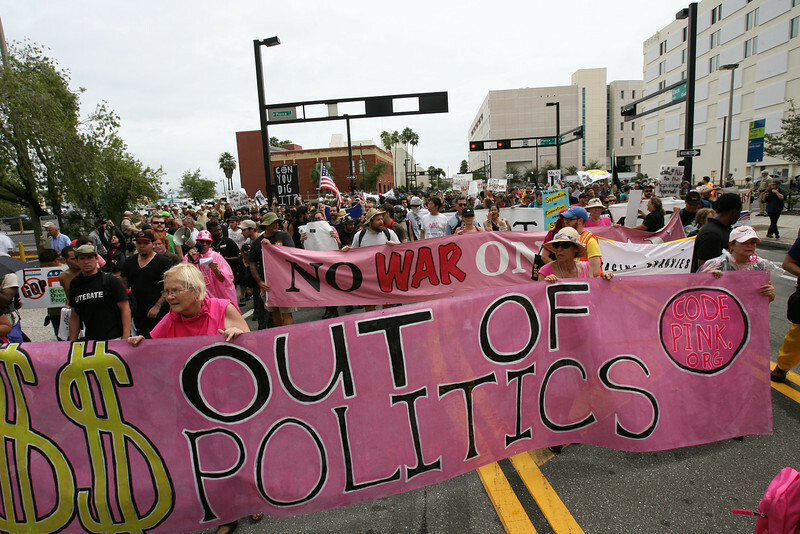 Several groups were involved in the march, including Code Pink, Occupy Wall Street, and Food Not Bombs. 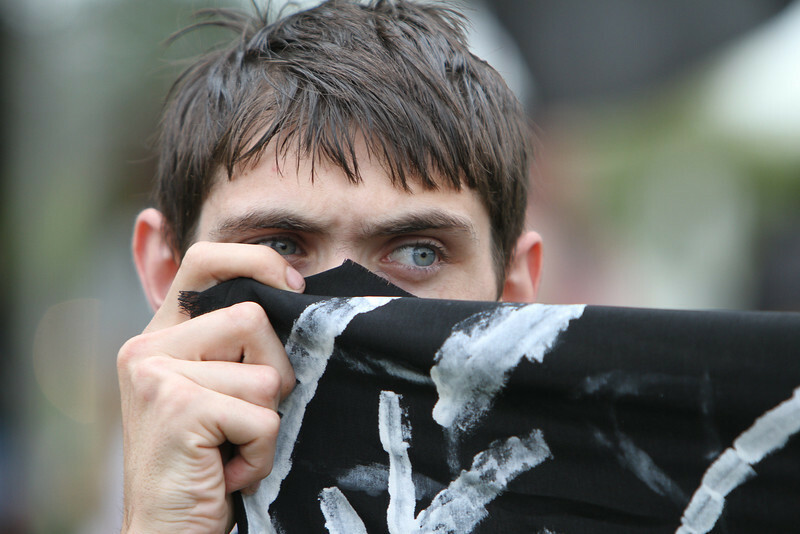 August 27th, 2012. 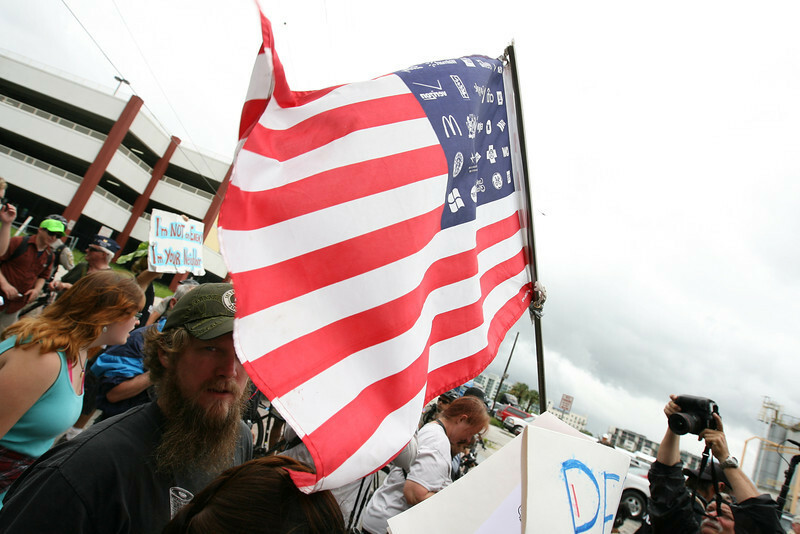 This take on the American flag, carried by protesters throughout the Coalition March on the RNC, displays corporate logos instead of the traditional stars of the states. 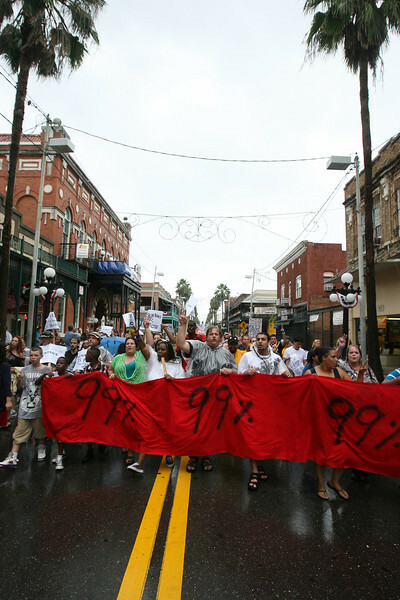 Tampa, Florida. 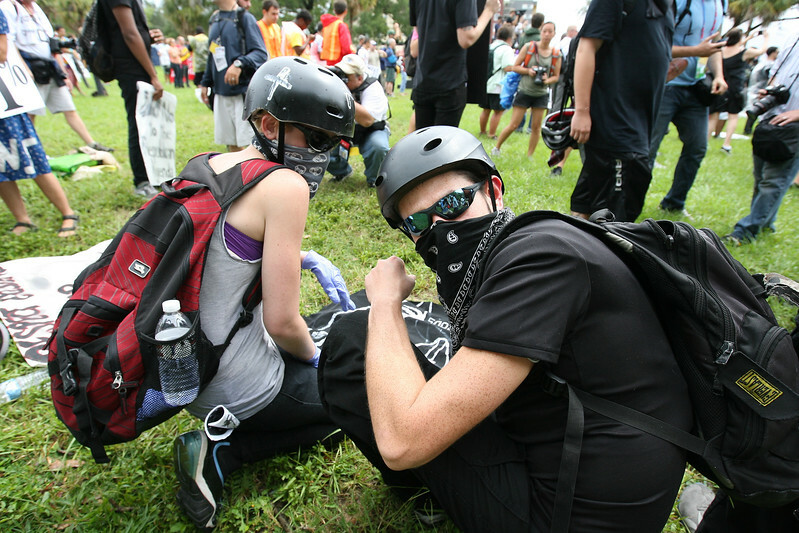 August 27th, 2012. 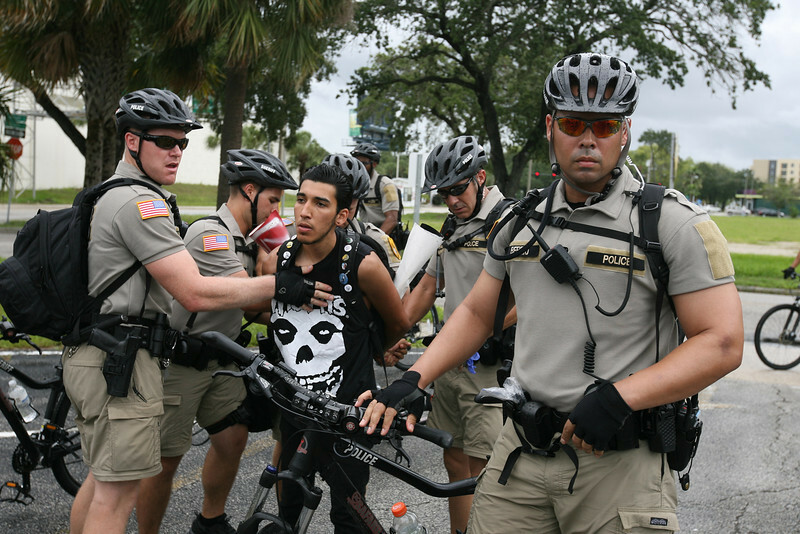 Dominic del Rosa, 19, was arrested after failing to comply with an event ordinance which prohibits the wearing of masks outside the Republican National Convention in Tampa, Florida on August 27th, 2012. 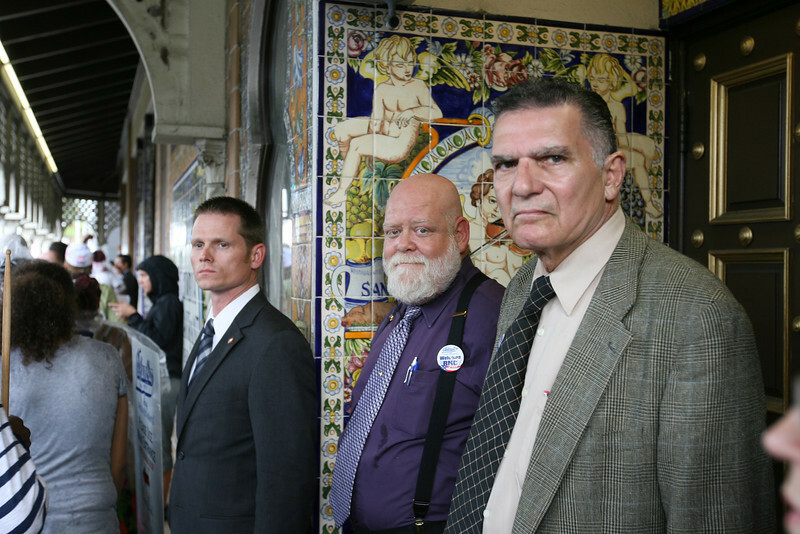 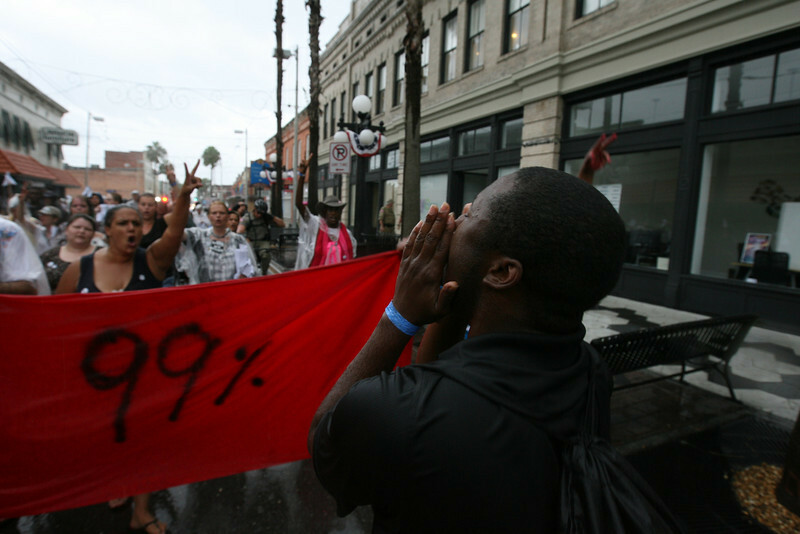 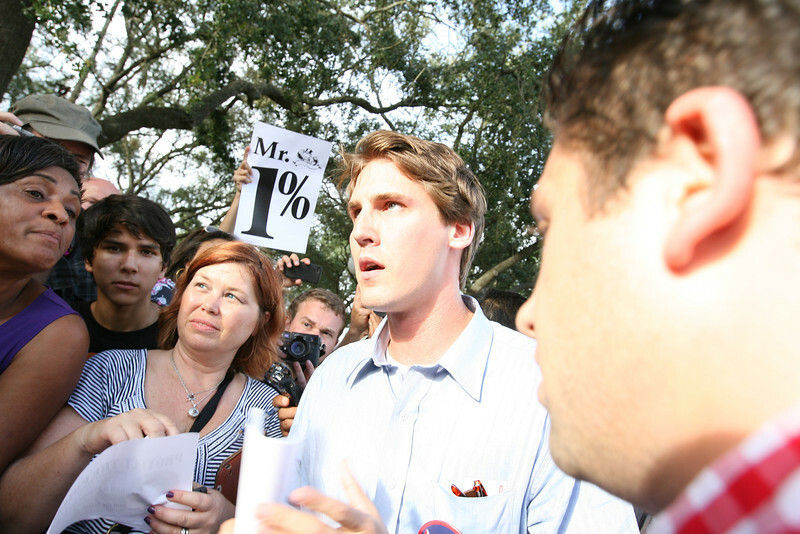 Protesters surround the Columbia restaurant in the Ybor City district of Tampa, Florida. 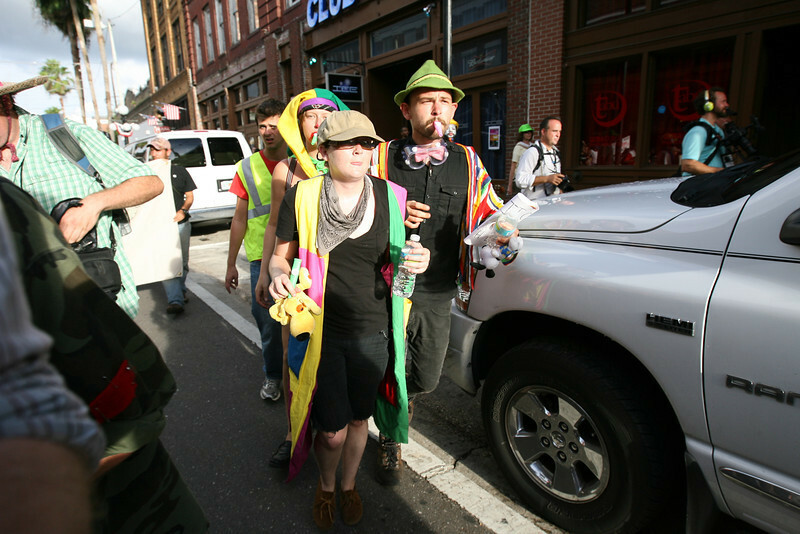 Moving around in tour buses, the protesters had stopped at Hancock Bank near International Plaza and then made their way to Ybor City where political fundraising dinners were being held. 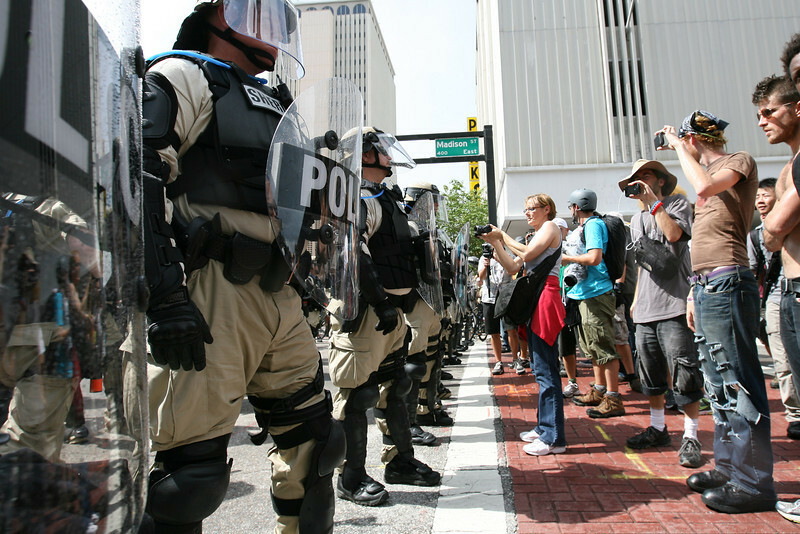 August 27th, 2012. 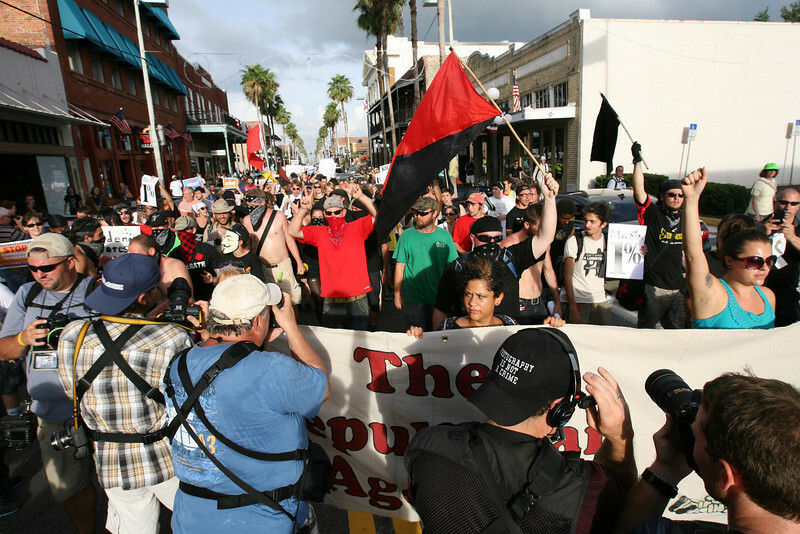 Republican National Convention protesters march down 7th Avenue in the Ybor City District of Tampa, Florida on August 27th, 2012. 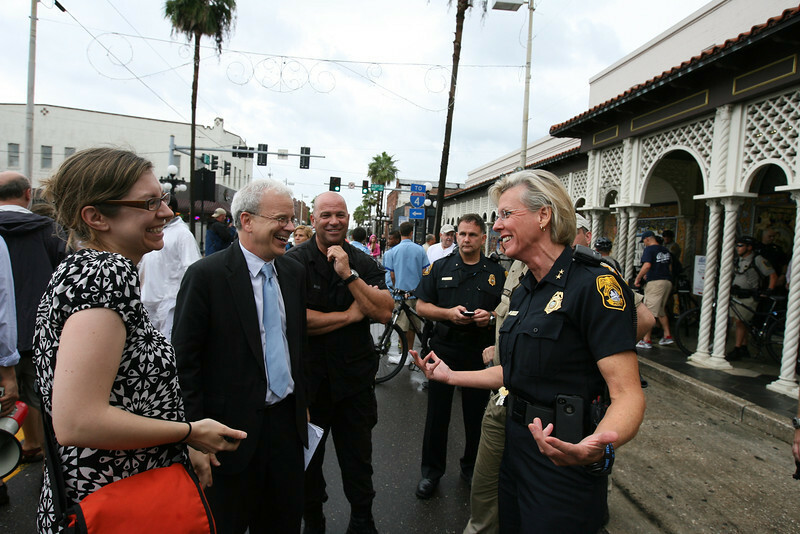 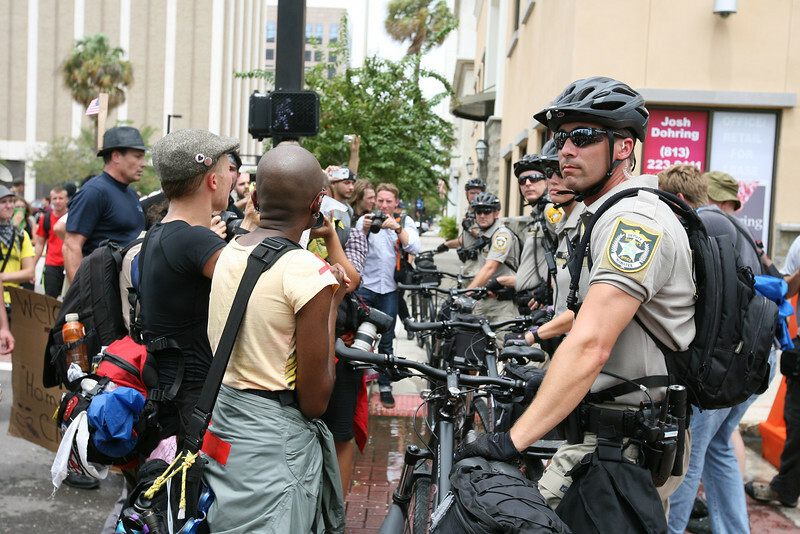 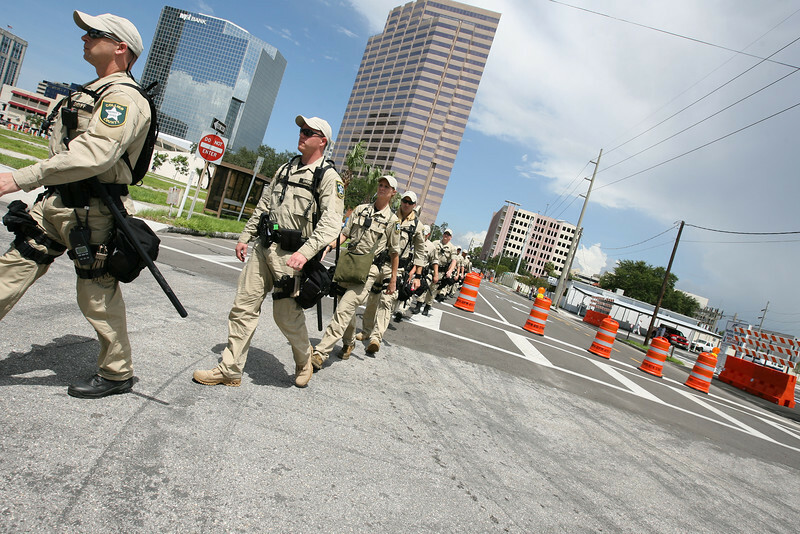 Police forces file down the street in formation, as they prepare to contain groups of protesters in the downtown area of Tampa, Florida on August 28th, 2012. 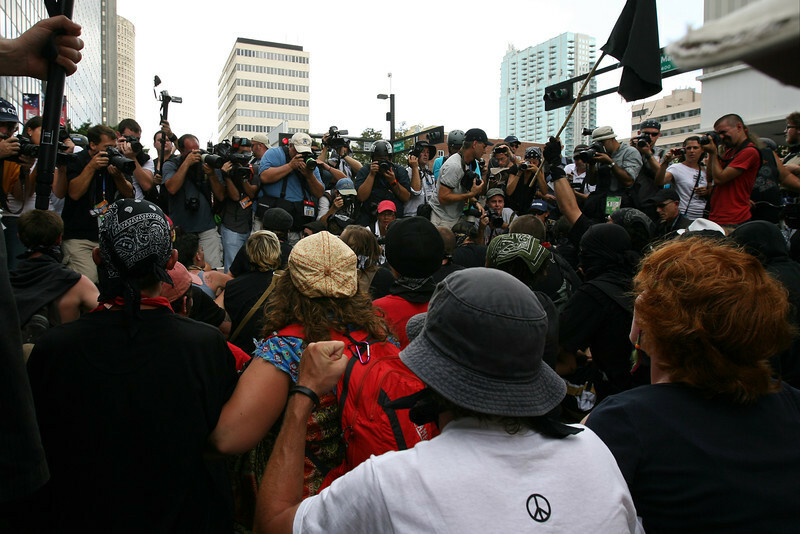 Members of the black bloc discuss their plans to move forward into the "public viewing area" at the Republican National Convention where members of Westboro Baptist Church were currently protesting. 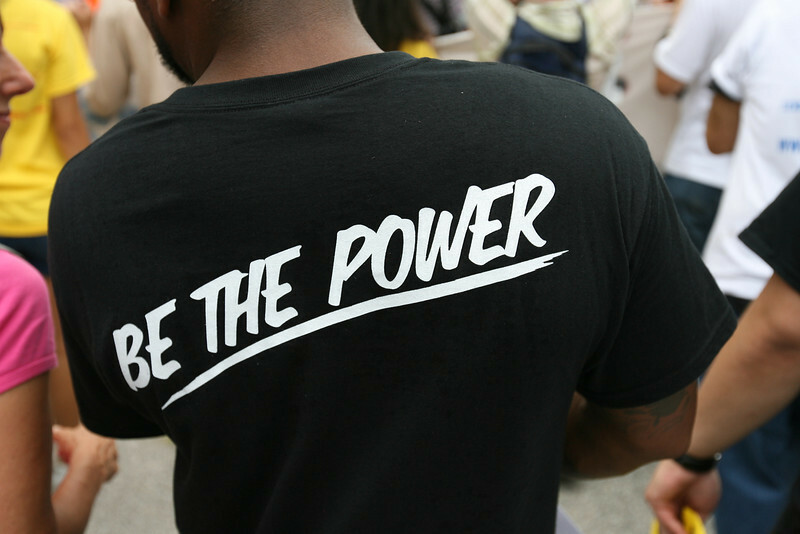 August 28th, 2012. 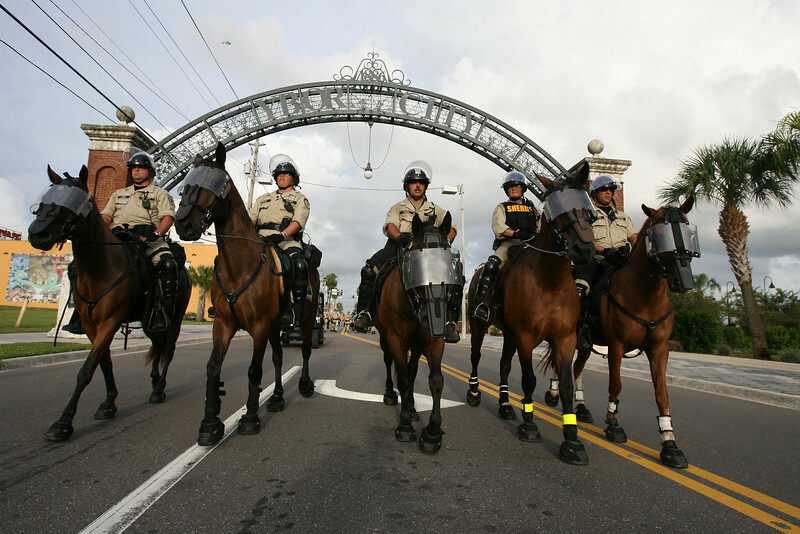 Tampa, Florida. 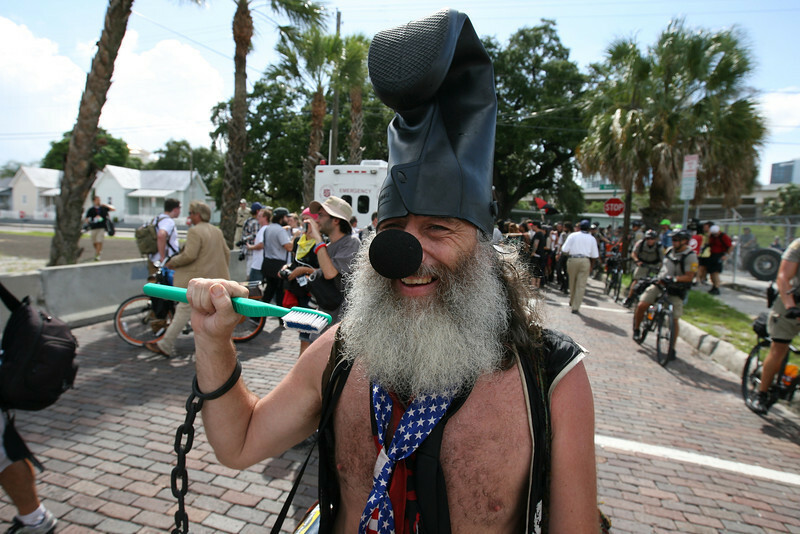 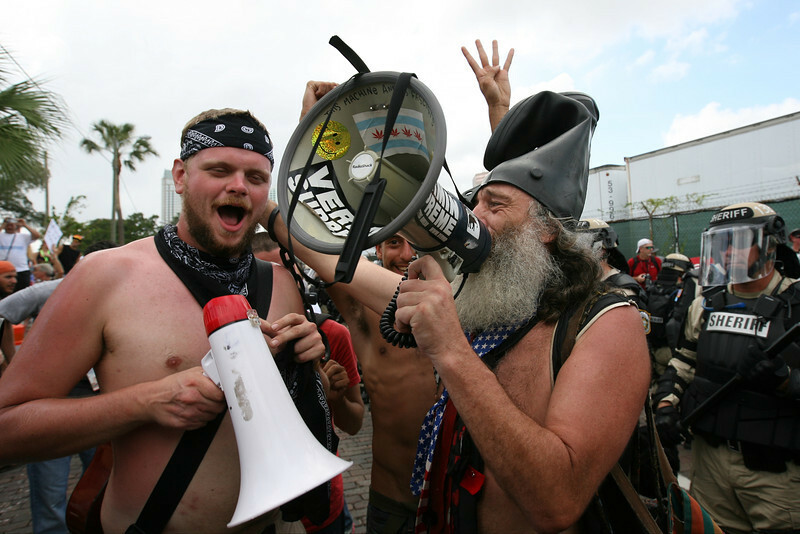 Democratic presidential candidate Vermin Supreme and Occupy activist Kevin Lash carry out a mocking rendition of the views shared by members of the Westboro Baptist Church who were sharing the public viewing area with several other protest groups. 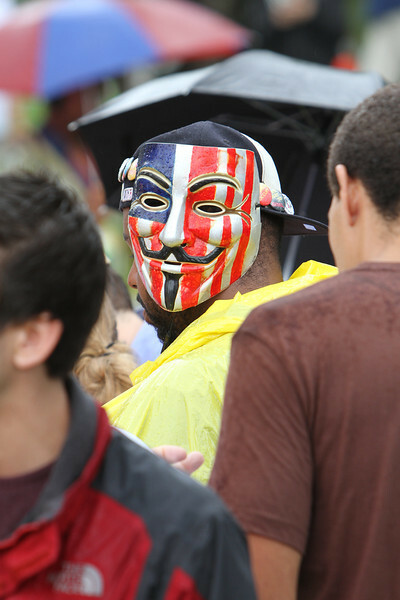 August 28th, 2012. 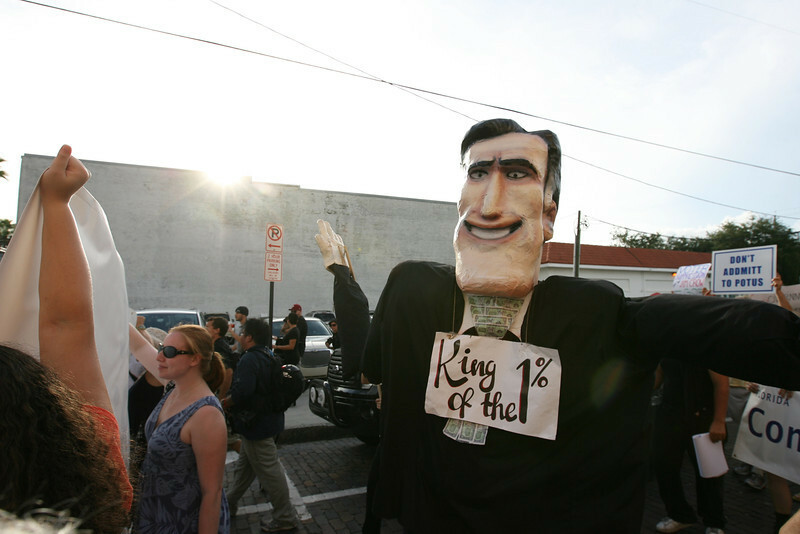 Tampa, Florida.